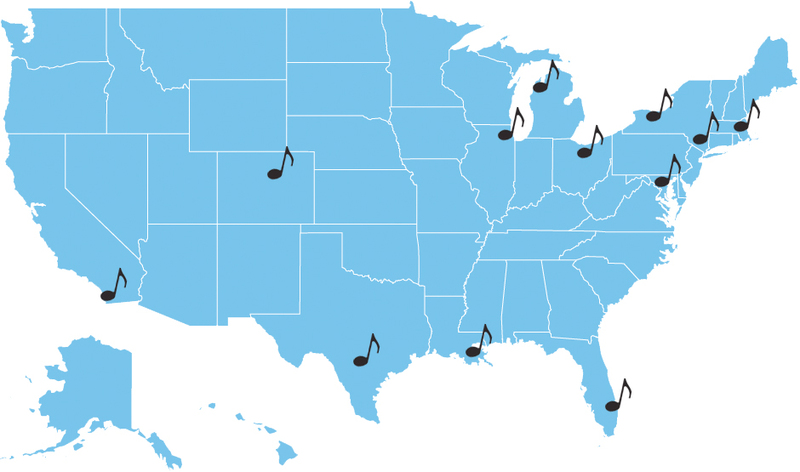 The Cleveland Institute of Music may be coming to a city near you! Throughout the year, the CIM Admissions team visits performing and visual arts college fairs across the United States. Prospective students, family members and teachers would benefit from speaking with a CIM representative at a college fair, as a wealth of information about the Institute and community is provided. Below are all of the states and college fairs we plan to visit in 2018. September 21 | Los Angeles County High School for the Arts (LACHSA) | 12:45pm | Meet with Assistant Director of Admissions Rachel Kunce! September 22 | San Diego NACAC Performing and Visual Arts College Fair at the University of San Diego - Hahn University Center | Meet with Assistant Director of Admissions Rachel Kunce! September 23 | NACAC Los Angeles Performing and Visual Arts College Fair at UCLA | 1-3:30pm | Meet with Assistant Director of Admissions Rachel Kunce! September 24 | Idyllwild College Fair | Meet with Assistant Director of Admissions Rachel Kunce! October 12 | Denver Music College Fair | 7-9pm | Meet with Associate Dean of Admissions Jerrod Price! November 4 | D.C. NACAC at Ronald Reagan Building and International Trade Center | 1-3:30pm | Meet with Assistant Director of Admissions Rachel Kunce! October 15 | Florida Music College Fair | Meet with Assistant Director of Admissions Rachel Kunce! October 16 | Alexander W. Dreyfoos School of the Arts | 4pm | Meet with Assistant Director of Admissions Rachel Kunce! November 26 | NAfME's 2018 All-National Honor Ensembles at Disney’s Coronado Springs Resort in Orlando, Florida | 9:30-11:45am | Meet with Admissions Counselor Nina Takacs! September 30 | Chicago Youth Symphony Orchestras | Meet with Assistant Director of Admissions Rachel Kunce! October 4 | Northshore College Fair | Meet with Assistant Director of Admissions Rachel Kunce! September 23 | Peabody College Fair | 3-5pm | Meet with Admissions Counselor Nina Takacs! September 22 | New England College (NEC) Fair | 2-4pm | Meet with Admissions Counselor Nina Takacs! September 29 | Michigan Performing Arts College Fair | Meet with Assistant Director of Admissions Rachel Kunce! October 7 | Interlochen NACAC | 1-3pm | Meet with Associate Dean of Admissions Jerrod Price! October 5 | Cleveland Institute of Music College Fair | 4:30-6:30pm | We will be hosting some of the most elite music colleges and conservatories in the country. Learn more and register. October 8 | Oberlin College Fair | 4:30-6:30pm | Meet with Assistant Director of Admissions Rachel Kunce! October 22 | Cincinnati NACAC at Xavier University | 6:30-8:30pm | Meet with Associate Dean of Admissions Jerrod Price! November 12 | Project 440 (Philly) | 9:30am-3:30pm | Meet with Admissions Counselor Nina Takacs! September 29 | South Carolina Governor's School College Fair | Meet with Associate Dean of Admissions Jerrod Price! October 18 | Houston NACAC at Rice University – The Shephard School of Music | 7-9pm | Meet with Assistant Director of Admissions Rachel Kunce! October 20 | Austin NACAC at St. Edward’s University – UFCU Alumni Gym | Meet with Assistant Director of Admissions Rachel Kunce! September 25 | AYPO | Meet with Admissions Counselor Nina Takacs! October 13 | Governor's School College Fair | 10am-3pm | Meet with Admissions Counselor Nina Takacs!